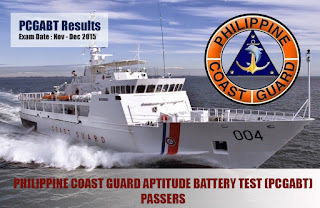 PCG Aptitude Battery Test Results for Nov- Dec 2015 | Complete List of Passers #PCGABT - Exam News, Reviewer, Military Career, & Everything [MN] . .
Manila - The Philippine Coast Guard (PCG) released the results of recent Aptitude Battery Test (ABT) conducted by the PCG Recruitment Branch on November to December 2015 at PCG districts in Manila, Cebu, Davao, Palawan, Bicol, Tacloban,Tuguegarao, Iloilo, and Cagayan De Oro. The partial list of results were released on February 20,2016 and was posted to PCG Recruitment Branch facebook page.